In 1950, Dr. Bascom Waugh became the first African American doctor to join the medical staff at Cooper. A World War II veteran, Dr. Waugh was a former flight surgeon for the 332nd Fighter Group, the legendary Tuskegee Airmen. According to a 2007 Air Force School of Medicine report, Dr. Waugh was one of the first two African American doctors to be trained alongside Caucasian physicians in the Army’s School of Aviation near San Antonio. He joined seventeen other African American flight surgeons supporting the approximately one thousand Tuskegee-trained pilots, and he was one of only six who served in combat during the war. When he returned from the war in 1946, Dr. Waugh opened a family medicine practice in Camden, where he worked until he died in 1992. 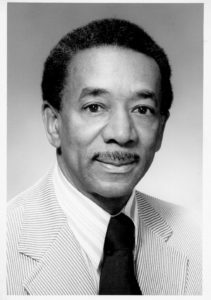 According to Cooper officials, Dr. Waugh not only provided medical care to thousands of Camden City residents, he was an inspiration and role model to African Americans from all over the region who were interested in health care careers. He broke racial barriers during a time when discrimination was common, even in the field of medicine. This text is excerpted from “Cooper: The Story of Cooper Hospital 1887-2017” (c) 2018 by Cooper University Health Care.